These aren’t useful threads of thoughts though. So, here’s just one example of how I tackle my mind out of the feeling of wanting more growing space. It’s by concentrating on ritual as the yield. In the past, I was lucky enough to experience having 20 acres and being able to collect fallen branches and twigs after a storm to store as firewood.Now, in a backyard farm, I have young fruit and nut trees, one large lilly pilly shade tree and a long wait for lots of fruit and nut trees to mature. A few years ago I researched trees and small shrubs that could be used as a harvest for wood on a small scale, for basketry or kindling. This brought me to the Vitex agnus castus, or Chaste Tree. 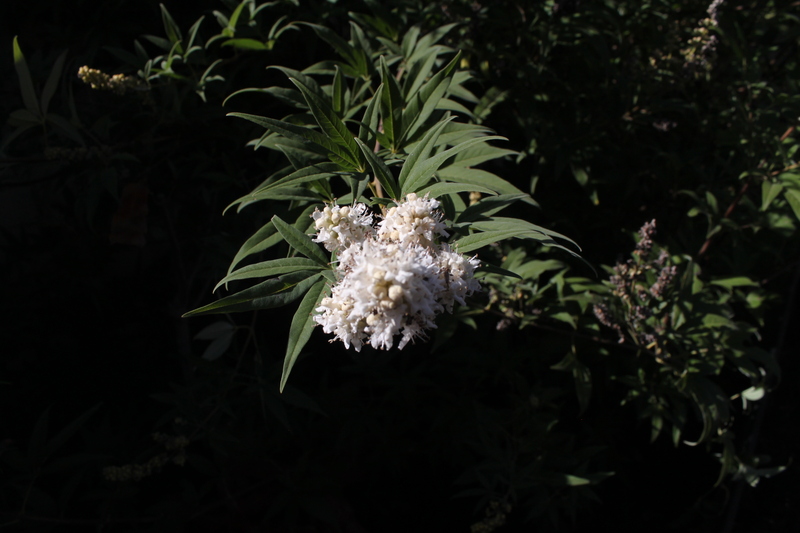 It ticked all the boxes with buddleia like bee-attracting flowers, deciduous in winter and with pliable limbs that could be cut to ground level. This is the white variety and the flowers tower over one of the raised vegetable beds, calling all the bees in the area over to my tomatoes. The chaste tree dies off in autumn, you can cut the branches to ground level, and quite late into Spring (many people often think the tree is dead) it will suddenly burst into new green life anew and grow even thicker woody branches than the previous year. The branches also have a lovely earthy scent. Here is the small bunch of wood from last year, dried over summer and ready for use either as kindling or maybe some beginners basketry? It’s not much is it? It won’t go far this winter. But does that matter? Is the size of yield the achievement? This is about being in touch with harvesting wood as a ritual, about repeating a seasonal pattern and about that sense of being human in a permaculture system in a managed backyard garden. The ritual is the yield here. This is like a small echo of an ancient wood harvesting management called coppicing, where young forest trees were cut down to the ground to resprout. I’m not encroaching on a forest or the wilderness, so it’s a good rhythm for this space to harvest the long bare branches each winter. It’s a way to be in touch with a rhythm of taking from nature in a way that allows the tree to regrow even more vigorously, with even more blooms offered up to pollen craving bees through Summer. 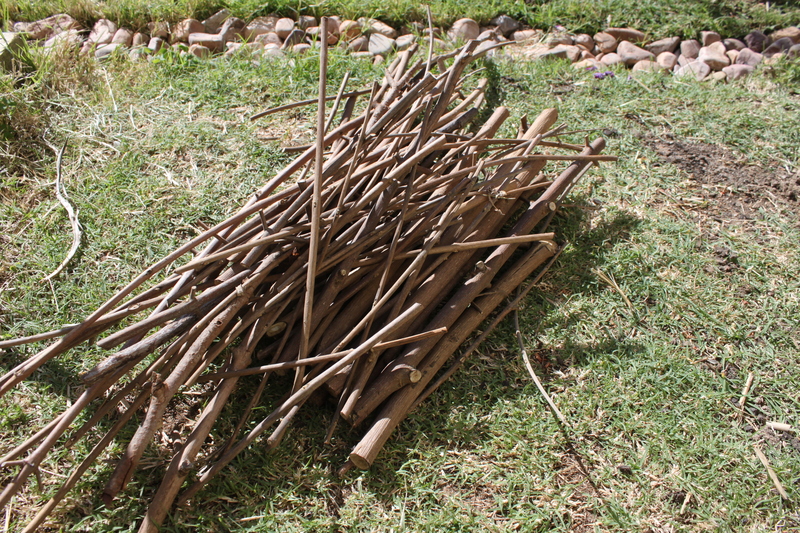 There is a huge sense of worth in that little bundle of sticks and knowing that the next season will yield a slightly thicker little bundle of sticks. If you have any other suggestions for plants and small trees that allow a small yield of wood like this, would love to hear about them.